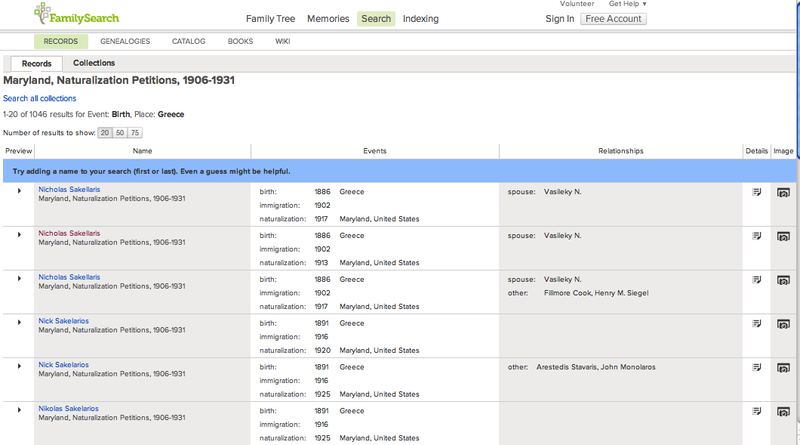 FamilySearch.org has a FREE database titled MARYLAND, NATURALIZATION PETITIONS, 1906-1931. There are 1,046 entries for people born in Greece. The collection consists of approximately 13,800 naturalization petitions filed in the U.S. District Court for the district of Maryland. It also includes certificates of arrival, oaths of allegiance, and declarations of intention to naturalize. The collection corresponds to NARA publication M1640: Naturalization Petitions of the US District Court for the District of Maryland, 1906-1930. Index provided by Fold3.com. The card index is arranged alphabetically by surname. It is very accurate and the information that was current at the time of naturalization was usually reliable. However, there was always a chance for misinformation. Errors may have occurred because of the informant’s lack of knowledge or because of transcription errors or other circumstances. There may be more than one person in the records with the same name. You may not be sure of your own ancestor’s name. Your ancestor may have used different names, or variations of their name, throughout their life. If your ancestor used an alias or a nickname, be sure to check for those alternate names. Even though these indexes are very accurate they may still contain inaccuracies, such as altered spellings, misinterpretations, and optical character recognition errors if the information was scanned.